Propostion 7, the last proposition of Wittgenstein’s Tractatus Logico-Philosophicus states, “Whereof one cannot speak, one must be silent.” One of the central themes of Wim Wenders' Pina is liminality. Pina Bausch's dance is liminal in that it deals with an edge of experience that can no longer be expressed in words. And what is that edge? It’s pain and love and longing. 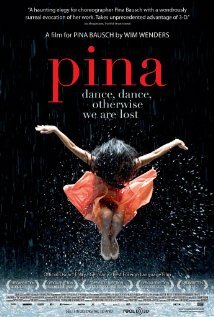 Her dancers describe Pina Bausch as a watcher. They were her paint and what a great way to view a film about a watcher but in 3-D (in several sequences of the film you actually watch an audience watching—in 3-D— which is one reason Pina could be subtitled adventures in perspective). And then there are the numerous set pieces which constitute the best of Pina, a woman being dismantled from a lover’s embrace, a man balancing sticks, a kind of Eve in reverse sequence where a muscular woman gives birth to a man. But from the point of view of meaning making one can’t help but ask if the edge is not an “event horizon,” followed by a black hole. Pina’s Bausch’s medium was dance/theater (her company was Tanztheater Wuppertal Pina Bausch) and one would assume that the element separating dance/theater from dance is the emphasis on human emotion over pure movement. Yet one wonders. If there are elements of human emotion that cannot be expressed in words, are they not sometimes best left to silence rather than movement?